Jam + Risotto = Delish. 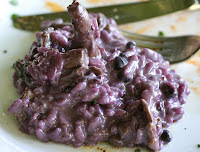 We are competing in the the 2nd Annual Risotto Challenge on May 23rd, and in preparation we have begun inventing and taste-testing some jam inspired risotto recipes. Heat a dry non-stick frying pan and, when hot, fry the pancetta until browned and crisp. Drain and set aside. Warm both milks in a separate saucepan, but do not boil. Add the butter to the pan and allow to melt and bubble on a medium heat. Pour in rice and cook for a minute in the butter. Add half the blueberries into the pan. Add milk one ladle at a time until each ladle is absorbed. Add the maple syrup, scraped vanilla and a pinch of salt about half way through the process. Continue adding milk until all six cups are absorbed. Rice should be al dente at this stage. Stir through the remainder of the blueberries. Add a dollop of mascarpone (to cut through the sweetness) and the pancetta upon serving. Jam class at Brooklyn Kitchen June 23rd!